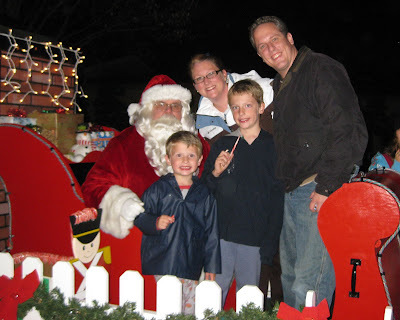 My Wandering Life: Santa Claus! 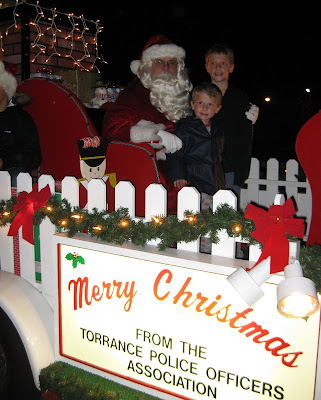 Santa came to our neighborhood, as he does every year, thanks to the Torrance Police Department. He rides around in a sleigh, accompanied by police cars and cheerful family members of the police department. As I mentioned before, we don't really "do" Santa, so the boys were so funny, asking if he was real. Does he look real? Yeah. Well, then I guess he must be, right? They got candy canes and then ran around with the other little kids in the neighborhood until they were giddy tired. Fun times. that is the cutest family picture!! !